Graz is the second largest city in Austria immediately after the capital Vienna. 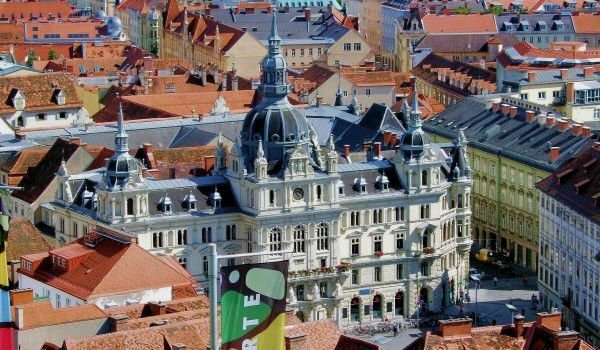 With a population of about 300, 000 people, Graz is a small but extremely interesting and varied. It is the administrative center of the Styrian countryside, occupying territory in south eastern Australia. The river Mura crosses Graz. With its six universities Graz has long been known as a student city. The number of students who study in Graz is about 44 000. In 1573 was founded the first school in town, and twelve years later and the first university (1585). Over a short period of Lutheran history of the town here was founded the Lutheran School, in which teaches Johannes Kepler. Many more famous names followed into Graz, such as Nikola Tesla, who teaches electrical engineering at the Polytechnic in 1875. Between 1909 and 1938 in the city taught Nobel laureate Otto Leuven, and in 1936, here Erwin Schrödinger is a lecturer. Graz is a city in which was located the home to the Bulgarian Prince Alexander I Battenberg, who died there in 1893. For the first time Graz was mentioned in historical documents from 1140 relating to the construction of the monastery Abtei Seckau. The first sketches and notes to build a firewall date from 1233. With the completion of this medieval defensive structure Graz first acquires the right to be called a city, and in 1245 received its own coat of arms. In the following centuries between 1379 and 1619, Graz has served as the residence of the Habsburgs. Territories of Graz today have been inhabited 5 000 years ago during the Copper Age, as evidenced by archaeological artifacts. Somewhere around the 6th century Slavs arrived here and built on the place of the current town a fortified castle. It is from this period that comes the modern name of the city. Slovenian "Gradetz" means "small town". In the course of history, the city bore the names "Gretz" and "Gratz". Today Graz is a very nice place to rest. Most of the city's attractions are concentrated in the central part of the old city. The historical center of Graz is one of the best preserved in Europe, it is listed as a UNESCO World Heritage Site in 1999. You can not miss the castle Shlosberg (Schloßberg), which is the most intriguing historical landmark of Graz. This castle was built during the Middle Ages and between 1125 and 1809 served as a fortress and remains unconquered. Shlosberg in Graz is included in the book of Guinness World Records as the strongest fortress in the world. In 2010, also became part of UNESCO's cultural sites. Today, in the old town of Graz can be seen more than 1, 000 buildings whose architectural styles range from Gothic to modern architecture. Among the most remarkable buildings of this is Town Hall and Museum of Art, known as the New Gallery. Landhaus, which meets the Federal Parliament of Styria, the Cathedral in Graz and its Gothic architecture and many other monuments also serve to grab attention. The symbol of Graz is considered the Clock Tower (Uhrturm), which is located on top of Shlosberg at 475 m altitude. A historic railway moves to the top, which also can be assigned to the list of most interesting sights of Graz. Outside the Old Town of Graz is interesting to visit the castle Eggenberg, which with its beautiful Baroque architecture was assigned to the cultural heritage of the old town of Graz in 2010. In 2003 Graz was declared the capital of European culture. Traditionally, the second largest Austrian city hosts many festivals of various kinds. Is a popular jazz festival that always takes place from mid July until the first week of August.